What’s more Australian than spinning a yarn or two around the campfire on a cold winter’s night? Nothing!!! Nothing that is, except tucking into a steaming hot pork stew and damper, cooked on that same campfire in a Kingaroy Choofer! So, meet the two people, who, in just thirteen years, have turned recycled gas bottles into one of the most in demand camping accessories on the market today … Kingaroy Choofers. 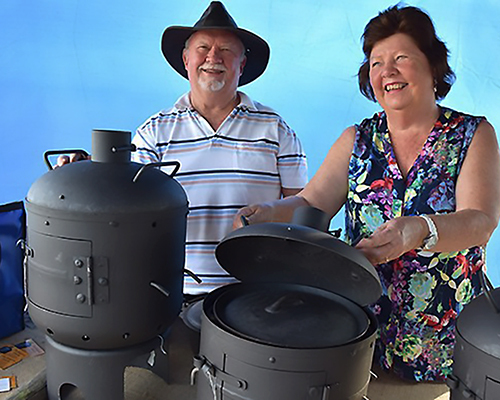 Their names are Bill and Patty Winters, and, as their product name suggests, they live and manufacture their Choofers in the Queensland town of Kingaroy. There’s no big factory assembly line here … no siree … just a little backyard industry that started in 2004 as a result of Bill’s love of “making things” for himself from scrap. Bill wanted a compact, versatile camp fireplace, easy to carry around in his caravan. Most of the home-made “pigs” he had seen were too big, limited in their use and poorly made. So, using good old Aussie ingenuity, he took an out-of-date 9kg gas bottle and removed the valve assembly. Then, after thoroughly cleaning the inside, he went to work with an angle grinder, plasma cutter and welder. The result was a light, portable fireplace, somewhat similar to the Kingaroy Choofer we know today. So light and portable, in fact, it stores in a milk crate. with the door open ready to add timber or briquettes. 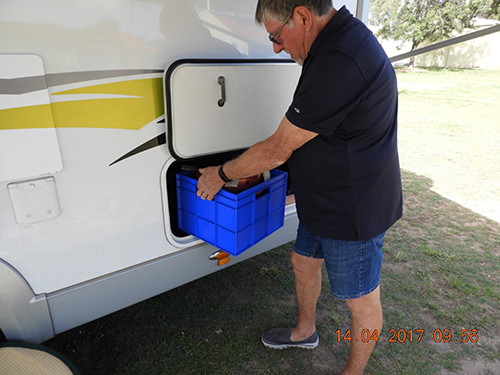 for easy storage in most motorhome and caravan lockers. Once seen in action by fellow campers, orders started to trickle in and before long Bill and Patty had a thriving cottage industry on their hands. In the ensuing years, Bill has gradually improved the design. Now, the “Kingaroy Pig” (as it was first known) has a new name and a new vibrant look. The original paint had a limited life. A 650-degree high-temperature resistant finish has now replaced that paint. In addition, Choofers now come in nine dazzling colours. And the range of gas bottles sizes has also been expanded. Want to see what one of Australia’s top-rated TV shows thinks of the Kingaroy Choofer? Watch Johanna Griggs and “Fast Ed” from “Better Homes and Gardens” prepare a mouth-watering dish of pork with peanuts and smoky tomato sauce in a Kingaroy Choofer. Go to the Kingaroy Choofer website. There are 19 items from which to choose. You may have to arrow to more than one page. Take your time. When ready to order, add each item of your choice, one by one, checking any options such as colour before adding another item. Readers of this article should use the coupon code GBR when ordering a Kingaroy Choofer. Type GBR in the coupon code box and you will receive a pair of general purpose gloves valued at $6 as a gift from us.